So much can happen between two slices of bread. Practical, portable, difficult to define and nearly impossible to mess up entirely, the sandwich offers a broad canvas for the harried parent or the creative chef. John Montagu (aka the 4th Earl of Sandwich) could never have dreamed of the baroque monuments that would be inspired by his modest request for meat served between sliced bread. A staple of pop culture (think Dagwood Bumstead or Shaggy from Scooby-Doo), the sandwich is a touchstone for cuisines and neighborhoods of all kinds. 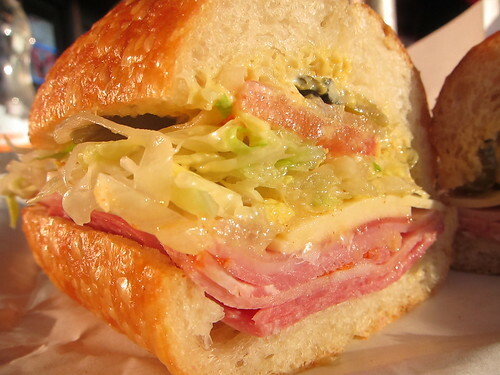 Herewith, a Los Angeles sandwich primer. 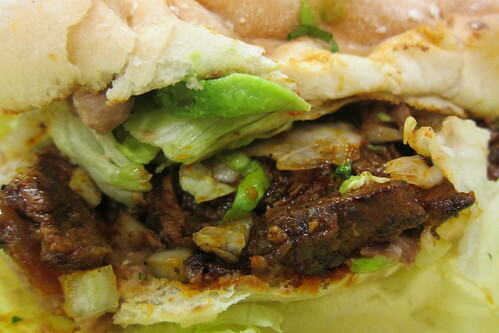 If you only eat one al pastor torta in Los Angeles, make it King Torta's. At this sandwich shop on the border of Lincoln Heights and El Sereno, the tortas are big and messy, the Sloppy Joe of tortas. 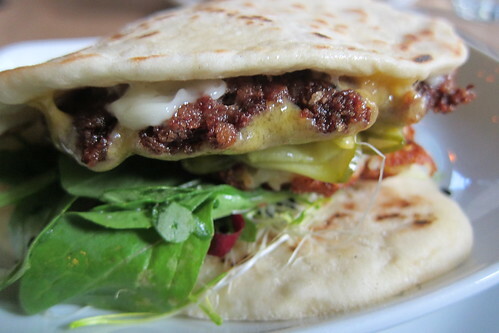 The bread is soft and doughy, almost undercooked, layered with chunks of juicy, not too fatty al pastor, shredded lettuce, avocado slivers and tiny chopped onions. The hot sauce is bitter and red; one taste of it and it became essential. What really makes the sandwich is the meat: King Torta's al pastor is tender and rich with a hint of sweetness, bathed in its own juices and flecked with copious chili seeds. At only $5, it's a hell of a deal. King Torta: 4507 Valley Blvd. L.A. In the evening, The Spice Table is all laksa and marrow bones, a Southeast Asian bistro that also spins a global menu of culinary hits. In the daytime, it's a casual lunch spot with bowls of curry chicken, cheeseburgers and bánh mì ($7-$9). 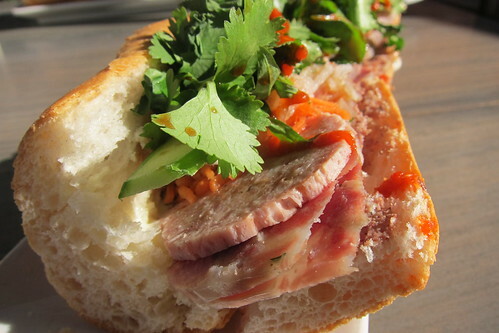 The cold-cut bánh mì is the classic choice. Smeared with a mellow pâté and piled with thin, cool layers of housemade charcuterie (sounds better than "head cheese," doesn't it? ), it's cradled in chewy French bread. 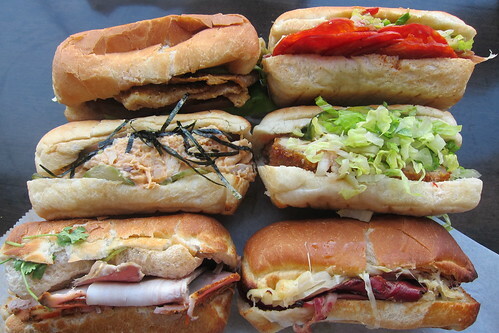 It's not the ubiquitous bánh mì of Orange County and the San Gabriel Valley. Lighter and cleaner, it's an ideal lunch. The Spice Table: 114 S. Central Ave., L.A.
Bay Cities Deli makes two dozen sandwiches, but the one for which it's most famous is The Godmother. Stacked with no less than five kinds of cold cuts -- Genoa salami, mortadella, coppacola, ham and prosciutto -- and a slice of Provolone, the sandwich sits on chewy Italian bread. Should you get mustard and mayo on your sub? Purists will tell you -- and we agree -- NO! This sandwich needs only a dash of oil and vinegar. Order it with the works and ask them to leave off the "mayostard." You can get it small ($6.25) or large ($8.15), but even the "small" Godmother is a mother. It's cool and salty, dense and filling, and definitely the Italian sub to beat. Bay Cities: 1517 Lincoln Blvd., Santa Monica. 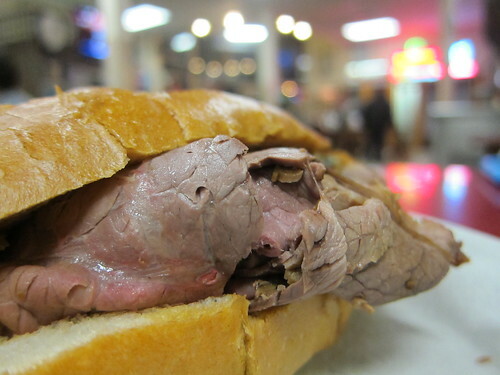 Once upon a time, Cole's and Philippe's had a French-dip rivalry. These days, the revamped, non-divey Cole's, with its simulacrum of a speakeasy tucked in the back, is a legitimately great cocktail haunt that happens to serve sandwiches. Philippe's is, as it ever was, a genuine, salt-of-the-earth sandwich Mecca. Philippe's French dip just tastes better. The meat is tender, thinly sliced and flavorful. Served on oblong French rolls that are heartily dipped (even double-dipped), the au jus soaks into the soft, springy bread. Lamb, beef, turkey, pork -- Philippe's has them all. The classic beef dip is the best. Whether 'tis nobler on the tongue to add hot mustard or eat it plain, that is still the question. 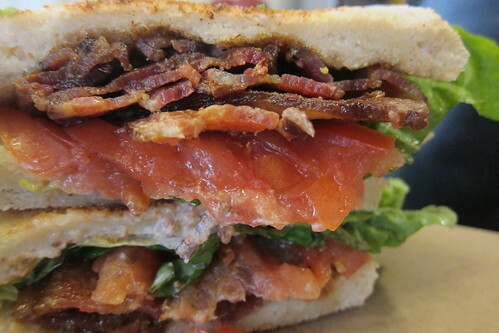 Philippe the Original: 1001 N. Alameda St., L.A.
Purists may confine their BLT consumption to tomato season. Hedonists will demand more bacon -- all the time. For the latter group, there's Kokomo's BLT. We can suffer an underripe tomato, but we cannot abide subpar bacon. Kokomo's bacon is thick-cut and devoutly smoky, with a suggestion of sweetness. There's soft white bread, crisp lettuce, a smear of mayo and tomatoes of varying quality, depending on the month. The bacon is always superb. Kokomo: 7385 Beverly Blvd., L.A.
5. Pork Meatball Sub at Fundamental L.A. 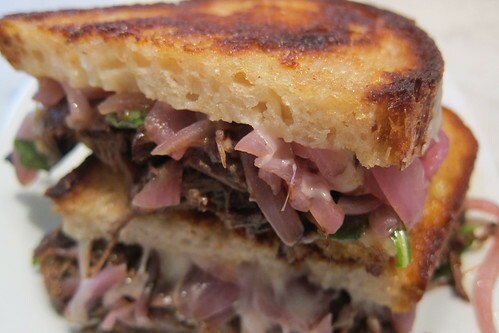 This Spartan shop makes sandwiches that are anything but basic. Crisp, fried sweetbreads, their richness mellowed by tart pickled turnips. Egg salad made sublime by crème fraîche in lieu of mayo. The menu changes daily, a policy as intriguing as it is frustrating. The sandwiches, on bread that's often house-baked, veer from upscale versions of American classics like meatloaf and grilled cheese to intense takes on the chicken torta and an Italian porchetta. Here, pork belly arrives in an inch-thick slab, slathered with tangy sauerkraut and grains of mustard as large as Beluga caviar. The hefty heap of meat looks intimidating, but it's tender and yielding on every bite. 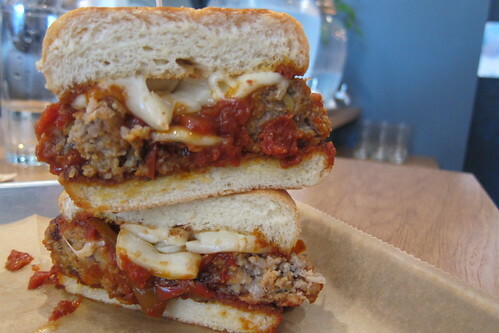 The meatball sandwich is simple -- no overworked ingredients or fussy spicing. It's a fluffy disc of bread piled with golf ball-sized meatballs of perfectly spiced pork dripping with the funk of taleggio. It's hearty, not leaden, leaving you full but wishing that your stomach was larger. Bonus: Fundamental L.A. makes the best vanilla soda in the city. Fundamental L.A.: 1303 Westwood Blvd., L.A.
Los Angeles' quintessential gourmet cafe continues to weave its spell with this sandwich: Hearty white country bread lavishly grilled in butter, a discreet heap of short ribs braised in their own juice until they turn impossibly tender, melted jack cheese oozing from both ends and sweet pickled red onions to give it a kick. Is it an amped-up grilled cheese or a restrained barbecue sandwich? It's both comforting and surprising. Joan's on Third: 8350 W. Third St., L.A.
Want to look like a dyed-in-the-wool Angeleno? Next time you visit Langer's, order the #19 without glancing at the menu. It's the most popular sandwich here: pastrami on rye with coleslaw, Russian dressing and Swiss cheese. The coleslaw adds crunch; the cheese, texture; and the dressing, a sweet, pickly tang. Langer's pastrami is sliced thickly, more like a slab of brisket than the thin, curling pastrami at most sandwich shops. The meat is tender and warm, modestly seasoned but intensely meaty, peppery without the overpowering sense of spice. It comes on rye bread so crusty, it makes Andy Rooney look like Pollyanna. Yet the bread, a true miracle of nature, is somehow exceptionally soft and chewy. 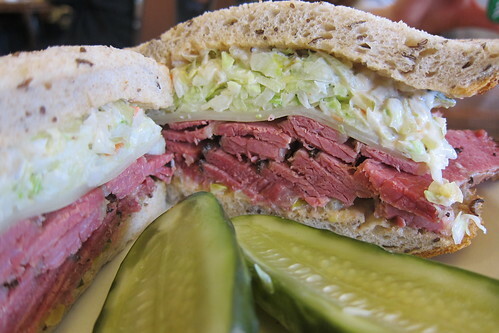 The best pastrami in Los Angeles, perhaps the country. Langer's Delicatessen: 704 S. Alvarado St., L.A.
Sotto: 9575 W. Pico Blvd., L.A.
Of all the gentrified, non-deli sandwiches in this town, Josef Centeno's bäcos are the most original and most compelling. A sandwich that Centeno has offered, in various iterations, at many of his restaurants, bäcos are wrapped in soft, pita-like bread and filled with intriguing flavor combinations. A few bäcos appear at dinner, but they drive the menu at lunch. The Original, with crunchy yet tender chunks of fried pork belly and a garlicky, almondy salbitxada (a Catalan sauce), is the restaurant's namesake. But the best bäco is the Toron. A generous scoop of oxtail hash rests on a pancake of shredded potato that would make bubbe proud, topped with melted cheddar and a mess of tartly dressed sprouts and greens. 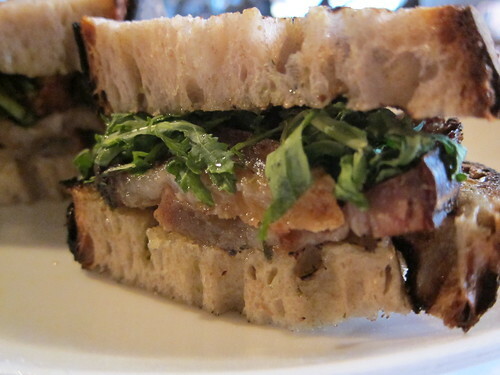 It's the sandwich ne plus ultra: meaty, bready, melty and brilliant. Baco Mercat: 408 S. Main St., L.A.
Runners-up: Cheesesteak at Boos Philly Cheesesteak, The Farmer at Daily Dose, Pastrami at Mezze, The Godfather at ink.sack, Tongue at Attari Sandwich Shop, Bacalao at Cook's Tortas, Fried Chicken Sandwich at Son of a Gun, anything with bacon at Salt's Cure. Be sure to download our Best Of mobile app for more of this sort of thing. Burgers, coffee shops, bakeries, ice cream shops, burritos, etc. Follow Squid Ink at @LAWeeklyFood and check out our Facebook page. Follow the author at @ElinaShatkin or contact her at eshatkin@laweekly.com.